Tomorrow is C-Day! 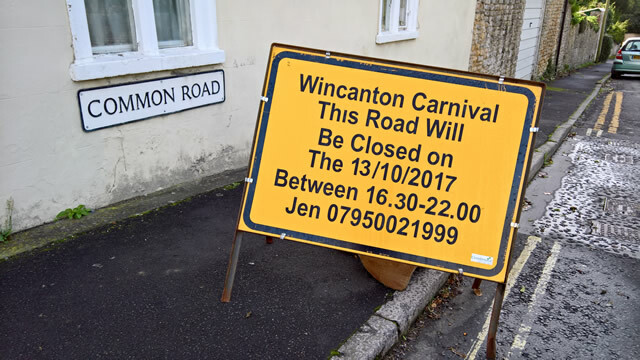 The 2017 Wincanton Carnival will start at 7:30pm, Friday 13th October. What could go wrong? 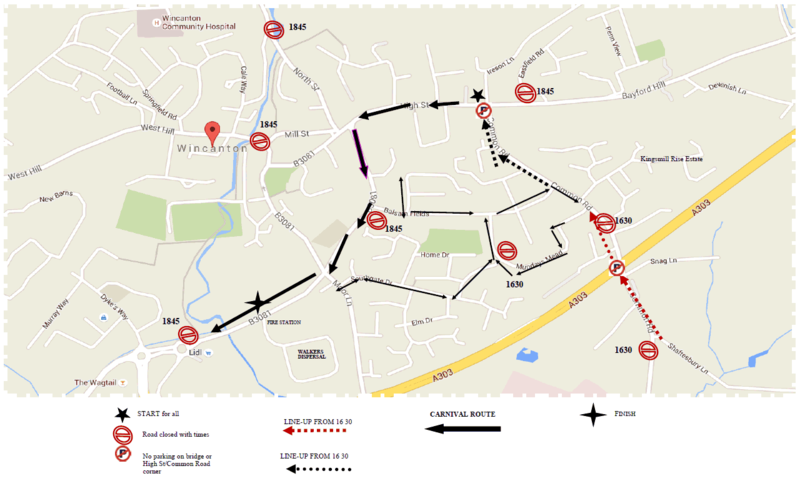 The Wessex carnival circuit is small, with events in Sturminster Newton, Mere, Warminster, Trowbridge, Wincanton, Castle Cary, and Gillingham. It may be tiny compared to the giddy heights of the Bridgwater carnival, but it scores high on quality. 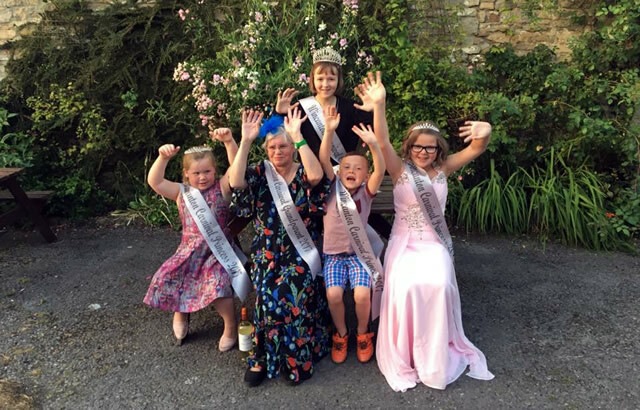 This year, Wincanton spectators will see fifty entries including five full sized floats and a great selection of walking and commercial entries. There will be catering stands along the carnival route, and in the car park of The Bear Inn there will be stands selling drinks, milkshakes and Spanish churros. If you believe weather forecasts, Friday is going to be cloudy, with a high of 18 degrees and a low of 14. The risk of rain is said to be 10% with humidity of 77%. If this forecast holds true it bodes well for the event. 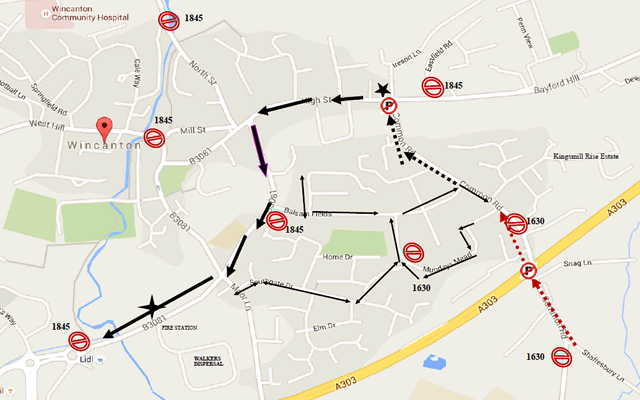 This year the carnival entrant assembly point will be in Common Road, between the Mundays Mead junction and the Shaftesbury Lane junction on the south side of the bridge over the A303. This section will be closed to traffic from 4:30pm, and there will be diversion signs and marshals to help get people where they need to be. Residents of Balsam Fields, Balsam Lane, Bramble Way and Snag Lane will still be allowed access to their properties. Due to operating costs, the survival of events like this is uncertain. Committees have to work both hard and smart to raise finance every year. The Wincanton committee has learned from previous events, and for the first time they are setting up their own merchandising stands to sell toys and glow sticks. There will be two stands; one near the top of High Street near Uncle Tom’s, and one in the layby outside Wincanton Primary School. These are the official carnival stands, and stewards manning the stands will be wearing official carnival hi-vis vests. Carnivals also create opportunities for street pedlars to sell balloons, toys and glow sticks, but unfortunately these traders make no financial contribution to the carnival. To them it is simply a commercial outing to sell their wares on the night, and all their income goes home with them. Most are licensed and have every legal right to operate. A pedlar needs only to produce a certificate at the event and neither the carnival stewards nor Police have any legal grounds on which to ask them to leave. With all carnivals using hi-vis vests to identify official personnel, pedlars have been known to abuse the system, copying the official vests so that spectators believe them to be official carnival traders. In an attempt to break this trend, the Wincanton committee are withholding their official vest design until the last minute. 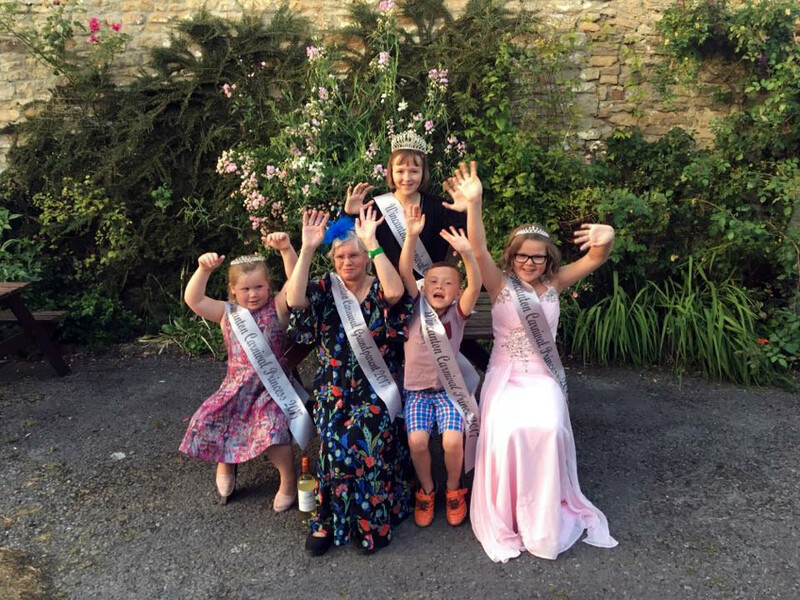 They are appealing to all spectators to support only official carnival stalls, knowing that the sales proceeds will go towards ensuring the future of Wincanton Carnival, and local causes. Sky is 15 years old and a student at King Arthur’s School. She was a Carnival Princess in 2015, and thrilled to have been chosen as Carnival Queen this year. Leo is 7 years old and a pupil at Wincanton Primary School. He was also Carnival Prince in 2016. Gracie is 5 years old and a pupil at Wincanton Primary School. Sue is the first Glamorous Gran since the carnival was resurrected in 2015. She has always been very supportive of the Carnival and is delighted to be taking part.